the silkworm: TEMPERATURE STRESS INDUCED TRANSCRIPTION AND ITS POSSIBLE APPLICATION IN SILKWORM BREED IMPROVEMENT. TEMPERATURE STRESS INDUCED TRANSCRIPTION AND ITS POSSIBLE APPLICATION IN SILKWORM BREED IMPROVEMENT. The mulberry silkworm (Bombyx mori L.) is one of the most thermal-sensitive organisms. Intensive and careful domestication over centuries has apparently deprived this taxon of opportunities to acquire thermo tolerance. This vulnerability is more pronounced in bivoltine races compared to polyvoltine ones. Thus, among many factors attributed to poor performance of the bivoltine strains under tropical conditions, the major one is lack of thermo tolerance. Many quantitative characters decline sharply at higher temperatures. Therefore, one of the key considerations in developing bivoltine hybrids for tropics could be need for thermo tolerant bivoltine races. This could be achieved through hybridization of polyvoltine with bivoltine races which is a prolonged and tedious procedure mainly due to the delay in fixation of economic characters. In India earlier efforts in this direction using Pure Mysore, a comparatively robust but poor silk yielding Indian race did not yield expected outcome which pointed out that- economic cocoon traits were negatively correlated with high temperate resistance (Tazima & Ohnuma, 1995). The recent advances in silkworm breeding and those in stress induced protein synthesis have opened up new avenues to evolve robust productive silkworm hybrids. Heat shock is nothing but a thermal injury caused by sudden increase in temperature in biological molecules like DNA, RNA, lipids, etc., of the cell which are vulnerable to heat stress. This leads to a number of abnormalities at cellular level. Normal pattern of protein synthesis halts. Transfer RNA and ribosomal RNA loose conformational integrity leading to degradation. DNA looses ability to function properly. There is aggregation of intermediate filamentous proteins at the nucleus instead of forming the cytoskeleton. At the same time pH of body fluid also drops. Increase of temperature leads to increase in kinetic energy of macromolecules, decrease of ionic bonds, hydrogen bonds, Van - der - Waals bonds etc., and increase its hydrophobic interactions; leading to loss of its shape. Denatured proteins also get adhered to DNA and restrict enzymatic access to DNA causing large-scale DNA damage. The heat shock thus ultimately leads to death of cells. Another most important effect of temperature (or stress of any kind) is on cellular proteins by unfolding them. 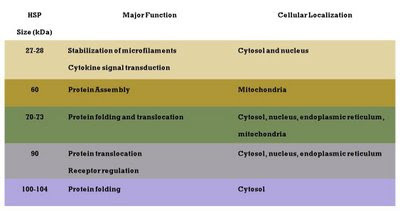 Cellular proteins are typically folded in their native conformations while functioning in cells. They unfold at the following contexts: 1) during de novo synthesis of polypeptides and assembly of multimetric proteins; 2) during intra cellular transport and organellar import when a protein must unfold or remain unfolded to cross the boundary of a cellular compartment; 3) during or after exposure to a protein denaturing stress. At these times unfolded proteins may be susceptible to inappropriate interactions with one another or with other cellular components. More over once unfolded, a protein can prospectively interact with folded proteins and induce them to unfold. Such interactions can result in aggregates of unfolded protein that at best diminish the pool of functional proteins and at worst are cytotoxic (Feder, 1996). However, a brief exposure of cells to sub-lethal high temperature was found to render protection to the organism from subsequent and more severe temperature. In a study with heat shocked Drosophila subobscura Digley and Smith (1968) reported continued survival and acclimatization of the experimental insects at higher temperatures. It was Ritossa (1962) who reported that the metabolic inhibitor dinitrophenol and heat induced a characteristic pattern of puffing in the chromosomes of Drosophila. It was observed by the author that when Drosophila larvae were shifted from 27°C to 37°C temperature similar puffs appeared in the polytene chromosomes. This discovery eventually led to the identification of the heat-shock proteins (Hsp) or stress proteins whose expression these puffs represented. By the mid-1980's, investigators recognized that many Hsps function as molecular chaperones. The word chaperone (pronounced as 'sha-pə-"rōn) means ‘an older person who accompanies young people at a social gathering to ensure proper behavior; broadly: one delegated to ensure proper behavior’. Molecular chaperones work more or less in a similar fashion. They are a class of proteins that enable the cell to cope with the problem of protein unfolding subsequent to a stress. Chaperones can recognize and bind to the exposed side groups that charecterise unfolded proteins. In so doing molecular chaperones prevent the bound side groups from engaging in inappropriate interactions with other cellular components, as well as stabilize the bound proteins in an unfolded state. Alternatively, chaperones can target bound proteins for degradation or removal from the cell. The constitutively expressed heat shock proteins (heat shock cognates) perform these roles for nascent polypeptides or proteins that unfold during normal cellular processes, while the inducible hsps function in response to the protein denaturation due to stress. A summary of the mechanism for expression of heat shock proteins within a cell is given by Kregel (2002) as follows. ‘Heat shock factors (HSFs), present in the cytosol, are bound by heat shock proteins (HSPs) and maintained in an inactive state. A broad array of physiological stimuli (“stressors”) are thought to activate HSFs, causing them to separate from HSPs. HSFs are phosphorylated by protein kinases and form trimers in the cytosol. These HSF trimer complexes enter the nucleus and bind to heat shock elements (HSE) in the promoter region of the Hsp gene. Hsp mRNA is then transcribed and leaves the nucleus for the cytosol, where new Hsp is synthesized’. Subsequently, every form of stress is known to induce these proteins in all tested organisms from bacteria to man. Inducing stresses include ethanol, heavy metals, hypoxia, hyperoxia, changes in pH, free radicals, various poisons and toxins, ischemia, osmotic shock, ionizing radiation and many others (Feder, 1996). Thus the term “heat shock protein” is a bit of a misnomer, and it is more accurate to refer to these proteins as “stress proteins”. Yet the term heat shock proteins is so deeply entrenched in the literature and so accurate a descriptor of the response at high temperature that, it is likely to persist for years to come (Denlinger and Yocum -1998). The threshold temperature for Hsp induction is correlated with the typical temperature at which species live. Thermophilic species have a higher threshold than the psychrophilic species. Many species exhibit characteristic and distinctive patterns of Hsp expression (or non expression) during the various stages of development, including gametogenesis, embryogenesis and metamorphosis. Extensive studies have been conducted on the heat- shock response by a large number of workers across the world in a variety of insect species such as Drosophila sp. (Tissiers et.al., 1974; Lindquist, 1980, Gilchrist & Huey 1999; Karunanidhi et al, 1999), the locust Locusta migratoria (Whyard et al., 1986) Anopheles stephensi (Nath and Lakhotia, 1989), the tobacco hornworm - Manduca sexta (Fittinghoff and Riddiford 1990), the fleshfly-Sarcophaga crassipalpis, (Joplin and Denlinger 1990), Lymantria dispar (Denlinger et al., 1992). Studies examining stress protein expression in the wild or in response to laboratory stimulations or of natural stress regimes are still few. Nonetheless, even these few studies are sufficient to demonstrate that patterns of stress protein expression can be correlated with specie’s natural thermal environments; that is, cells and species from warm environments undergo a stress response at warmer temperatures than counterparts from cool environments (Lindquist, 1986; Huey& Bennet, 1990; Sarge et al., 1995; Somero, 1995). Numerous studies have now demonstrated that heat shock proteins are responsible for a large component of inducible thermotolerance (Morimoto et al., 1994). Studies in which hsp genes were either removed or their expression inhibited demonstrate a reduction in inducible thermotolerance (Sanchez and Lindquist, 1990; Craig and Jacobsen, 1984; Johnston and Kucey, 1988). Likewise the insertion of extra copies of the hsp70 gene increased thermotolerance in both cells (Li et al, 1991; Solomon et al., 1991; Li and Duncan, 1995) and whole organisms (Welte et al., 1993; Feder et al., 1996). The quest for heat tolerant silkworm breeds. Among many factors attributed to poor performance of the bivoltine silkworm strains under tropical conditions the major aspect is that many quantitative characters decline sharply when temperature is higher than 28°C. The risk of hybridization of polyvoltine to bivoltine could not be taken due to the delay in fixation of economic characters. The long and hard struggle to evolve robust-productive silkworm hybrids has not so far met with satisfactory results. Veteran silkworm geneticist Y. Tazima made one of the first attempts in this direction. He started a breeding experiment by using Pure Mysore and C134a as parent breeds, but did not yield expected outcome. Prof. Tazima concluded with an apprehension whether the heavy cocoon trait was negatively correlated with that of high temperature resistance (Tazima and Ohnuma, 1995). The only way out was to evolve tropical bivoltine breeds. In this direction a breeding technique was evolved at CSR&TI, Mysore, to select the robustness genes along with its modifiers in high temperature conditions. Consequently in 1988 a temperature tolerant bivoltine hybrid namely CSR18 X CSR19 was developed and authorized for commercial exploitation (Sureshkumar, et.al., 2002). Though the introduction of CSR18xCSR19 in the field for commercial rearing during summer months was seen as a big success, the productivity level and returns realized did not match to that of other productive CSR hybrids. Therefore, the acceptance level of this hybrid among farmers was not up to the expected level. As conventional breeding experiments encounter bottlenecks the silkworm breeder is bound to look for other possible options as molecular marker assisted breeding and transgenesis breeding. In spite of remarkable progress achieved in the disciplines of silkworm genomics, silkworm genetics, silkworm biotechnology and silkworm breeding no much result have been forthcoming in evolving temperature tolerant bivoltine silkworm breeds. Probably the reason for this lies in the fact that such a breed is largely the requirement of countries in the tropical sericulture belt as India, where interdisciplinary research is yet to materialize in its true sense. Though there are reports on the activity of heat shock proteins in silkworm, the body of literature available on the molecular mechanism of temperature sensitivity and heat shock response in silkworm is rather thin as compared to the enormous work done on other insects. Evegnev et al., (1987) studied heat shock response in Bombyx mori cells and found that temperature elevation induced active transcription of heat shock mRNAs in infected cells. But at the level of translation heat shock treatment failed to induce Hsp synthesis and was not able to inhibit production of polyhedrin in such cells. Joy and Gopinathan in 1995 reported the appearance of 93, 70, 46 and 28 kDa protein bands consequent to high temperature exposure in Bombyx mori. in both bivoltine and multivoltine strains, but with varying kinetics. The isolated hemocytes of multivoltine race exhibited the induction of 70 kDa protein. Lee et.al., in 2003 cloned a genomic DNA fragment containing a promoter region for the gene encoding an HSC70-4 homologue, the structure of which was deduced from the partial cDNA sequences that were registered in a Bombyx mori EST data base. The deduced amino acid sequence with 649 residues was 89% and 96% identical to those from Drosphilla melanogaster hsc-4 and Muduca sexta HSC-70-4 respectively. The expression analysis by reverse transcription PCR demonstrated that mRNA transcription occurred in all tissues examined and was not stimulated by heat shock. Thus HSC70-4, the molecular chaperon is ubiquitously expressed in every tissue of Bombyx mori. In a recent study Vasudha et.al., (2006) observed differential expression of hsps in silkworm strains. 90 kDa in the first, second and third instars, 84 kDa in the fourth instar and 84, 62, 60, 47 and 33 kDa heat shock proteins in fifth instar was observed in response to heat shock. Use of Heat shock proteins as molecular markers for evaluation and evolution of thermotolerant silkworm strains has been suggested by them. Considering the enormous investigations conducted on HSPs in a plethora of organisms ranging from bacteria to man, it is felt that there is an acute shortage of literature on the heat shock response of the silkworm Bombyx mori. However, the literature available on the heat-shock protein synthesis in other lepidopteran insects suggest that there is much scope for similar studies in silkworm HSPs in detail with the set target of harnessing the genes responsible for rendering thermo-tolerance in hardy polyvoltine that can be transferred in bivoltine breeds since high temperature resistance is recognized as heritable character in silkworm (Kato et al., 1989). In order to achieve greater success in this regard, there is dire necessity for (1) Understanding the molecular mechanism of temperature tolerance in silkworm; (2) Identification of the various families of HSPs synthesized and the threshold temperature, which induce their expression; (3) Understanding the differential expression pattern of various HSPs in bivoltine and polyvoltine races; and (4) To locate the genes responsible for the heat inducible HSPs and subsequent steps to introgress the same into the silkworm genome either by conventional breeding or by use of molecular techniques. The recent success stories in silkworm transgenesis (Tomita et al., 2003) shed rays of hope in this direction. Craig, E.A., and K. Jacobsen. 1984. Mutations of the heat- inducible 70 kilodalton genes of yeast confer temperature-sensitive growth. Cell 38:841-849. Denlinger DL, Lee RE, Yocum GD and Kukal O (1992). Role of chilling in the acquisition of cold tolerance and the capacitation to express stress proteins in diapausing pharate larvae of the gypsy moth Lymantria dispar. Arch. Insect Biochem. Physiol., 21:271-80. Dingley F, Maynard Smith J (1968). Temperature acclimatization in the absence of protein synthesis of Drosophila subobscura. J. Insect Physiol., 14:1185-94. Evgenev MB, Braude-Zolotareva TY, Titarenko EA, Levin AV, Denisenko ON, Ulmasov K and Karaev K (1987). Heat Shock response in Bombyx mori cells infected by Nuclear Polyhedrosis Virus. Mol. Gen. Genetics, 215:322-325. Feder, M.E., N.V. Cartaño, L. Milos, R.A. Krebs, and S.L. Lindquist. 1996. Effect of engineering hsp70 copy number on hsp70 expression and tolerance of ecologically relevant heat shock in larvae and pupae of Drosophila melanogaster. J. Exp. Biol. 199:1837-1844. Fernando P and Heikkila JJ (2000). Functional charecterisation of Xenopus small heat shock protein, Hsp 30 c: the carboxyl end is required for stability and chaperone activity. Cell Stress and Chaperons, 5:148-159. Fittinghoff CM and Riddiford LM (1990). Heat Sensitivity and Protein synthesis during heat shock in the tobacco horn worm, Manduca Sexta. J. Comp. Physiol., B160: 349-356. Gilchrist GW, Raymond B. Huey (1999). The direct response of Drosophila melanogaster to selection on knock-down temperature. Heredity, 83:15-29. Huey, R.B. & Bennet, A. F. (1990) Physiological adjustments to fluctuating thermal environments: an ecological and evolutionary perspective. In Stress Proteins in Biology and Medicine, ed. R.I. Morimoto, A. Tissieres &C. Georgopoulus, pp.37-59. Cold Spring Harbor, NY, Cold Spring Harbor Laboratory Press. Johnston, R.N., and B.L. Kucey. 1988. Competitive inhibition of hsp70 gene expression causes thermosensitivity. Science 242:1552-1554. Joplin KH, Yocum GD and Denlinger DL (1990) Cold shock elicits expression of heat shock proteins in the flesh fly Sarcophaga crassipalpis. J. Insect Physiol., 36:825-834. Joy O, Gopinathan KP (1995). Heat-shock response in mulberry silkworm races with different thermo tolerances. J. Biosci., 20:499-513. Karunanidhi S, Barclay JW, Robertson RM, Brown IR and Atwood HL (1999). Neuro protection at Drosophilla synapsis conferred by prior heat shock. The Journal of Neuro Science, 19:4360-4369. Lee JM, Kusakave TE, Kawaguchi Y, Yasunaga-Aoki C, Nho S, Nakajima Y and Koga K (2003). Molecular characterisation of heat shock cognate 70-4 promoter from the silkworm Bombyx mori. J. Insect Biotech. Sericology, 72: 33-39. Li, G.C., L.G. Li, Y.K. Liu, J.Y. Mak, L.L. Chen, and W.M. Lee. 1991. Thermal response of rat fibroblasts stably transfected with the human 70-kDa heat shock protein-encoding gene. Proc. Natl. Acad. Sci. 88:1681-1685. Li, D., and R.F. Duncan. 1995. Transient acquired thermotolerance in Drosophila, correlated with rapid degradation of hsp70 during recovery. Eur. J. Biochem. 231:454-465. Lindquist S (1980). Variying patterns of protein synthesis in Drosophilla during heat shock; implications for regulation. Developmental Biology, 77:463-479. Morimoto, R.I., A. Tissières, C. Georgopoulos. 1994. The biology of heat shock proteins and molecular chaperones. Cold Spring Harbor Lab. Press. 610pp. Nath BB, Lakhotia SC. (1989). Heat shock response in ovarian nurse cells of Anopheles stephensi. J. Biosci., 14:143-52. Sanchez, Y. and S.L. Lindquist. 1990. HSP104 required for induced thermotolerance. Science 248:1112-1115. Solomon, J.M., J.M. Rossi, K. Golic, T. McGarry, and S. Lindquist. 1991. Changes in hsp70 alter thermotolerance and heat shock regulation in Drosophila. New Biol. 3:1106-1120. Somero, G. N (1995) Proteins and temperature. Annual Review of Physiology 57, 43-68. Tissiers A,Mitchell HK and Tracy UM (1974) Protein synthesis in salivary glands of Drosophila melanogaster : relation to chromosome puffs. J. Mol. Biol., 84:389-398. Welte, M.A., J.M. Tetrault, R.P. Dellavalle, and S.L. Lindquist. 1993. A new method for manipulating transgenes: engineering heat tolerance in a complex, multicellular organism. Current Biol. 3:842-853. Whyard S, Wyatt GR and Walker VK (1986). The heat-shock response in Locusta migratoria. J. Comp. Physiol., 156B:813-817. Good – I should definitely say I'm impressed with your blog. I had no trouble navigating through all the tabs as well as related information. It ended up being truly simple to access. Nice job..
Hi everybody! Nice forum! I've found so much helpful information here. Hi there! I'm new here, but I'm lucky to have found such a great forum. Many thanks for sharing helpful advice here. Hey everybody! I'm new to this sphere, but I'm really interested in it. Could you provide me with some tips where I should start from?